As Chairman, Herb Tasker led the team that founded the third iteration of Mason-McDuffie Mortgage in 2005, bringing a historic name back into the real estate market place. The first Mason-McDuffie Mortgage was founded in 1887. 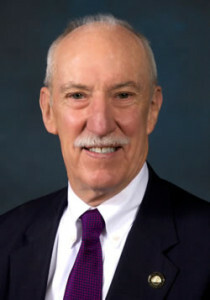 His involvement with Mason-McDuffie Mortgage dates back to the 1970s and he served as Chairman and CEO from 1982-1984. In addition to Mason-McDuffie Mortgage, Mr. Tasker has been successfully involved as a senior executive in the formation and eventual sale of other mortgage companies including All Pacific Mortgage and AIG Centre Capital. He is a former President of the Mortgage Bankers Association of America, as well as a former President of both the California Mortgage Bankers Association and the Southern California Mortgage Bankers. He currently serves on the board of directors of First American Title and AmNet Mortgage. Other board appointments include University of San Diego and the university's Burnham-Moores Center for Real Estate Policy Advisory Board. Mr. Tasker holds the title of Certified Mortgage Banker and is a registered California Real Estate Broker. He graduated from Colgate University with a B.A. in Psychology and a minor in Economics and earned a Certificate in Real Estate from the University of California, Berkeley. He is a member of the Santa Maria Parish Pastoral Council. In his spare time, he enjoys duck hunting and skiing in Lake Tahoe. He is married and has three sons, one daughter and 10 grandchildren.